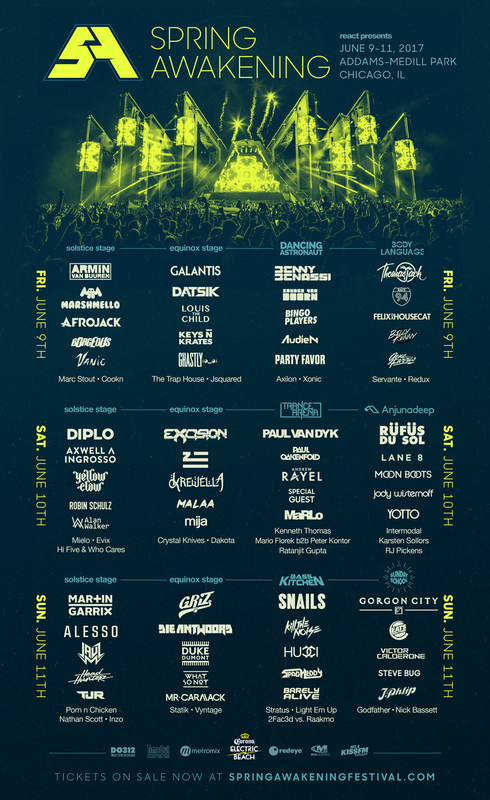 Adding to the already stacked lineup, React Presents has officially revealed the full daily line-up for the 6th annual Spring Awakening Music Festival. The announcement of Phase 3 showcases the news of when and where confirmed artists will perform. Headliners such as Marshmello, Louis The Child, Bingo Players and more will be tearing down their sets on Friday, June 9th on 1 of 8 branded stages. The Branded Stages are Solstice Stage, Equinox Stage, Dancing Astronaut, Body Language, Trance Arena, Anjunadeep, Bass Kitchen, and Sunday School. The weekend will also feature performances from the best in the game – Diplo, Jauz, Zhu, Chicago’s own Krewella, Robin Schulz, Die Antwoord and more will all be on hand. For those who have been holding out for Single Day tickets, your wish is now granted as Single Day tickets are now available. Better act fast, as these tend to go fast – You can purchase HERE. Spring Awakening returns to Addams/Medill Park in Chicago on June 9-11.